Heavy rain bands are moving across southern Louisiana. Harvey "does remain a named tropical storm and it's going to drop an awful lot of rain," Louisiana Governor John Bel Edwards said at a news conference Monday. "We do have a long way to go with this particular storm." The statement comes after Harvey tore through the Houston area this weekend, causing several deaths, forcing evacuations and wiping out homes. About 20 to 40 inches of rain has fallen in the Houston area, and additional rain is forecast for this week. The National Weather Service deemed the flooding "epic and catastrophic" on Sunday, and Texas Gov. Greg Abbot said the aftermath of Harvey will likely be "horrific" and leave behind a mess that will "take years" to rebuild. Edwards said 40 people from Louisiana's Department of Wildlife are in Texas are helping with rescue efforts, and added that Louisiana has not received a specific request from Texas or Houston to take in evacuees. If needed, the city of Shreveport will host displaced Texans, Edwards said, adding that shelters are ready. ABC News meteorologists say current radar shows heavy rain remaining near Houston, and heavy rain bands moving across southern Louisiana. Harvey is expected to make its third landfall east of Galveston on Wednesday morning and continue to move into northern Louisiana and southern Arkansas by the end of the week, they added. 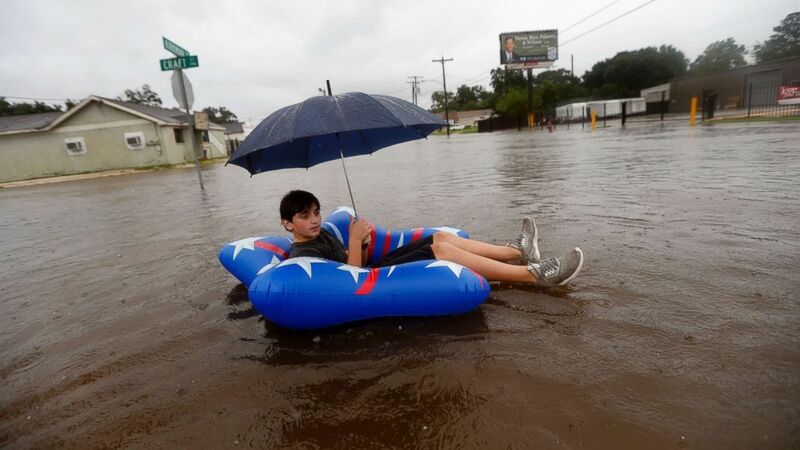 (Gerald Herbert/AP) Julius Verret, 14, floats in street flooding in Lake Charles, La., as the city receives heavy rains from Tropical Storm Harvey, on Aug. 27, 2017. Flash flood watches are in effect for eastern Texas, including Houston, and stretch across southern Louisiana toward New Orleans and parts of southern Mississippi. Overall, Louisiana has about five to nine inches of rain so far, and western Louisiana could get another 10 to 20 inches of rain, meteorologists say. (Rogelio V. Solis/AP) Jimmie Bradley speaks about the flooding in his neighborhood in Moss Bluff, a Lake Charles, La., suburb in Calcasieu Parish, Aug. 28, 2017. 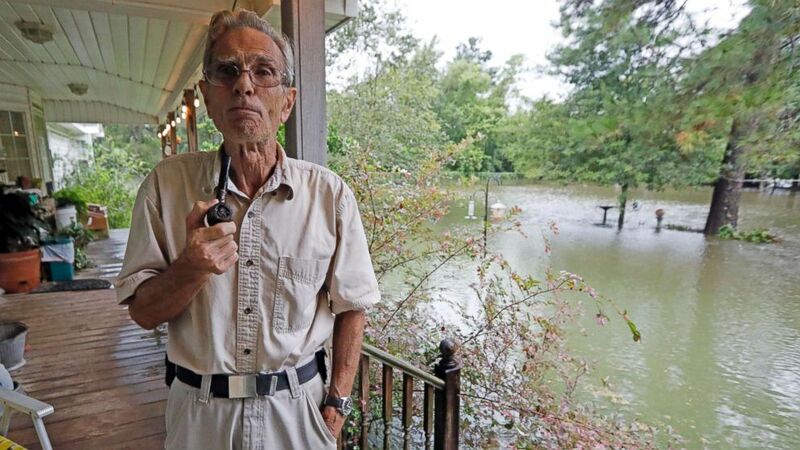 Bradley, 78, and his wife Brenda, had stacked sandbags at their doors, but the rising water was lapping at the steps to their back porch and had overtaken their front yard. Virtually every neighbor on Crawford Drive has at least a foot of water in their yards. Police in New Orleans say some city streets have already flooded, and New Orleans Mayor Mitch Landrieu said the city is hoping for the best, but prepared for the worst. Landrieu said that while 90 percent of pumps are able to operate, there were some pump and power issues during Monday's rainfall. He said the uncertainty of what is to come this week cannot be overstated, and he recommends that "everyone stay home tomorrow because of uncertainty about storm and diminished capacity of drainage system." Edwards said Cameron Parish is under an evacuation order, but there has not been significant structural damage reported in Louisiana at this time. Edwards said that President Donald Trump approved an emergency declaration, and shortly after the governor's news conference he tweeted that he spoke with Trump and "thanked him for the quick response to our emergency declaration request." The governor added that once the storm has passed Louisiana, the state can shift resources to helping Texas. ABC News' Melissa Griffin contributed to this report.